1987 The Text of the New Testament Translated by Erroll Rhodes, Eerdmans, Brill, Grand Rapids, MI, and Leiden. 1987 Novum Testamentum Graece, 26th Edition, following Eberhard Nestle and Erwin Nestle, Deutsche Bibelgesellschaft Stuttgart. 1753 Conjectures sur les mémoires originauz dont il paroit que Moyse s'est servi pour composer le livre de la Génèse. Avec des remarques qui appuient ou qui éclaircissent ces conjectures, Brussels. 1983 Biblical Words & Their Meaning: And Introduction to Lexical Semantics. Academie Books, Zondervan Publishing House, Grand Rapids, Michigan. 1977 Historical Criticism and Theological Interpretation of Scripture: Toward a Hermeneutics of Consent. Fortress Press, Philadelphia. 1974 Biblical Hermeneutics: A Treatise on the Interpretation of the Old and New Testaments. Originally published in 1890, republished by Zondervan Publishing House, Grand Rapids, Michigan. 1981 The Text-critical Use of the Septuagint in Biblical Research. Simor, Jerusalem. 1992 Textual Criticism of the Hebrew Bible. Fortress Press, Minneapolis. 1990 An Introduction to Biblical Hebrew Syntax. Eisenbrauns, Winona Lake, Indiana. 1882 Introduction to the New Testament in the Original Greek: With Notes on Selected Readings. Harper and Brothers, New York. Using the 1988 Reprint by Hendrickson Publishers, Inc., Peabody, Massachusetts. This final section looks at two methods used in teaching and edification, both in catechesis and during the sermon. Prooftexting and anecdotes are both methods of teaching the proper interpretation of Scripture. Both can be used appropriately. But both can also be grossly misused. The interpreter should be aware that these are opposite methods of instruction and interpretation. Prooftexting points the hearer/student toward a text of Scripture. Anecdotes point the hearer/student toward human experience. Prooftexting is one of the most basic methods of showing where and how Scripture teaches. It should never be minimized or eliminated. For every line in the Catechism the student should be taught where in Scripture the teaching is found and how it is rightly interpreted. For every claim about the will of God a pastor makes in his formal interpretation of Scripture (known as the Sermon) he should firmly ground the hearers in the texts which prove his claim. What is the verse reference? Is the pronoun “us” contrastive with or inclusive of the reader? Who specifically is meant by “us”? What issue was being addressed by the writer of this verse? What is the previous verse? What is the next verse? Where is this passage typically used in catachetical instruction? When is this passage read in the historic Church year? Why is it used on that Sunday? How is this passage used in the Confessions? What does this passage have to do with the forgiveness of sins? Is it a sin to take one's own life? God also forbids us to take our own life, or even to shorten it by harming our health. Acts 16:28: Do yourself no harm. Ask the same basic questions as above regarding this particular passage. Who was speaking to whom? What was the precipitating context? What is the concern? How does this particular wording legitimately extend beyond that context? Does this passage prove that suicide is a sin? With these words was Paul preaching the Law to this man? What should the interpreter know from context before making that kind of judgment? Consider Walther's treatment of this context in his fourteenth evening lecture on Thesis IX (p. 129ff). Students are better prepared when they know these passages in context and understand why they are used as well as limitations on their interpretation that need to be considered. They should be directed chiefly to strictly relevant passages and contexts and not be given a passage as a prooftext that has convenient wording, but which is in actuality only related to the topic by extension of thought. Prooftexting has the distinct benefit of putting the actual Word of God into the hearer's heart and mind as the source and norm for interpretation of God's Word and their own instruction. But there is another method of interpretation that has been increasingly used in the sermon, the anecdote. The anecdote is at best a well told example or story that illustrates a point of scriptural interpretation and makes that point more memorable to the hearer. A generation or two ago these used to be called “illustrations.” In the pages of Concordia Theological Monthly there were several articles from the 1930s to the end of the 1950s that discussed the proper and improper use of illustrations. The basic thrust of these articles was that an illustration should not be the fulcrum upon which the sermon balanced, it should not be more memorable than the Scripture itself, and it should not replace the Scripture as the basis for instruction and interpretation. Rather, the good illustration lead the hearer to remember the Scripture better, to understand the Scripture itself better, to enable the hearers to explain and interpret the Scripture to others in a clear way—all so that the Scripture had the preeminence. But anecdotal preaching styles have been growing in Confessional Lutheran circles. Christ's use of parables is often cited as justification for this manner of preaching. And, as stated above, anecdotes can be used properly. However; in his public interpretation of Scripture—the sermon—the preacher must bear in mind that an anecdote by its very nature points people to human experience, not to the Scripture. This author's experience with anecdotal preaching at Conventions, Conferences, and other venues within his own synodical fellowship has lead him to question the value that seems to be placed on this type of Scriptural interpretation. Most congregation members probably do not read the Scripture regularly at home. The most time an average congregation member spends in contact with Scripture is usually the Divine Service each Sunday—assuming that the member attends that regularly. Assuming that the Divine Service has not been subverted to the “Hey God, look at me, I think You're really Big and Totally Awesome” schlock,2 the hearer has about 15 to 20 minutes worth of exposure to Scripture presented to him in liturgical form. Perhaps another 15 in hymnic form—if the hymns are scriptural. What is left? The public interpretation of Scripture—the Sermon. Once each week the preacher, the public interpreter of the Word of God, has an opportunity to present the truths of God's Word to the flock placed under his charge by God. What is it the public interpreter of God's Word wants the hearer to remember? --that the pastor tells funny stories? that the pastor had members at his previous calls who often had bizarre life experiences? that the pastor watches a lot of TV/Movies/ reads a lot of books/ spends a lot of time online? The public interpreter of the word has a captive audience for 15-25 minutes during which he has their attention. Why are they there? Why has God called that pastor there? There is no story, anecdote, or illustration that this author could think of for which there is not already an example in Scripture itself. Why not give them Scripture? Is 15 to 25 minutes of Scripture too much for the hearers to handle? Are the public interpreters of God's Word being taught to be so inept that they cannot rely upon Scripture to explain Scripture. Do the preachers not want their hearers to know and love each of the people mentioned in the Bible and understand the examples they give—it was for this reason that God had their experiences recorded! A proper paper would have a conclusion and wrap things up. This author chooses to leave the reader to evaluate the whole on his own, and to evaluate his own situation in response to this paper. May it be of some good use. 1 Question 81 in the 1966 edition, and the prooftext is used for Question 54 in the 2001 edition—which is also about suicide. David committed adultery with Bathsheba. Should you? What are the limitations on the use of descriptive passages in establishing doctrine? We know that God condemns worship based on our own ideas of how to approach and appease Him. Consider Aaron's sons: Nadab and Abihu.1 No one could question that they were sincere. No one could question that they wanted to do something for God. Theirs was a harsh lesson between the prescriptive and descriptive. The text about them is not only a description but gives the prescriptive will of God concerning the worship they were supposed to have offered. Can certain descriptive passages be used to establish doctrine and practice? Yes! Consider the doctrine of the Hypostatic Union of Christ. The various passages that describe Christ as man and as God must be understood as limitations on how we are to understand Christ's Divine-Human nature when the prescriptive texts tell us to worship Him as the One True God. Can it be that certain prescriptive passages do not establish doctrine and practice? Yes! Consider the commands for the observation of the three high festivals when every circumcised male was to appear at the Temple, or the command to stone rebellious children to death. These are certainly prescriptive passages, but there is more in the Scripture that tells us about how we are to view the ceremonial and civil law since their fulfillment in Christ. In the end it is the context of the whole of Scripture that shows the interpreter what is to be normative for faith and life. But by nature all Christians want to be pietists and transfer their memberships to the church of Galatia. The opinio legis is our constant companion. Preachers are never to think themselves exempt. As interpreters of God's Word to God's flock it is a constant temptation to try to preach the Third Use of the Law. When we attempt to do so we usurp the work of the Holy Spirit. The Three Uses of the Law are not guidelines on how preachers are to attempt to use the Law of God in interpreting the Scriptures to His flock. The Three Uses of the Law are descriptions of how God the Holy Spirit uses His own Law in working on the hearts of the hearers. It is this author's opinion that all pastors need to reread four books at least each year: The Bible, The Lutheran Book of Concord; The Hymnary; and Walther's The Proper Distinction Between Law and Gospel. Each interpreter of Scripture should be able state clearly and concisely why these particular four works should be selected out for pastors in particular. These works represent the source and norm of interpretation, the confessional limits and experience of the Church in interpretation, the application of interpretation to the flock in its worship and life, and the proper application of God's Word to the flock during the chief act of interpretation: the sermon. The frequency of rereading is not meant to be understood as a divine directive to the reader. It is meant to point out the weaknesses of the interpreter and his need for constant refreshing, reeducation, and edification of his own knowledge and skills. Constant immersion in these sources, chiefly the Scriptures, will enable the interpreter to grow in discernment between descriptive and prescriptive passages as well as their proper application to the flock of God. With all the hullabaloo in the reaction against Post-modernism there is now an almost shocking embrace of Modernism in Confessional Lutheran circles. Part of this embrace of Modernism is due to the fact that Modernism is the fall-back position against Post-modernism. But the main cause for the embrace of Modernism is the continual indoctrination and inundation that takes place from birth on, within Western civilization and its educational, scientific, and governmental institutions. Consider the statement: “separation of church and state.” Can the interpreter of God's Word draw a clear distinction between the Doctrine as it is found in Scripture, the political right guaranteed by the U.S. Constitution to its citizens, and the popular cultural post-modern interpretation? How many readers of this paper can make these distinctions clear to their own parishioners? The notion of inalienable human rights, as presented in the Declaration of Independence, is not a scriptural doctrine but the ideological child of the Enlightenment (the main philosophical movement toward Modernism) handed down to us through humanist philosophers such as John Locke, Benjamin Franklin, James Madison, George Mason, and Thomas Jefferson. Modernism is woven into the fabric of America's founding, it's law, and it's promulgation as a politically free society. Following the influence of John Dewey (1859-1952) upon public (government sponsored) education, religion—particularly Christianity—has been excised from influencing most citizens of the U.S. in their formal educations since the late 1930s. Most academically acceptable publications and research in the areas of the original languages of Scripture and its history that are available to the interpreter come from a strictly Modernist Materialistic perspective. As shown by the evidence in the sections on Text and Tools earlier in this paper, academically respectable biblical scholarship embodies a rejection of Scripture as the authoritative Word of God. Instead, such respected scholarship views Scripture as a phenomena of human historical development. So consider what is “history?” Is it a factual description of the past? Is history reliable? Is history true? Can history serve as a limit on the interpretation of Scripture? In as far as history is a human effort to recover and explain the past to those in the present and future, most history written today is simply speculative fiction about the past. In the so-called “Historical Grammatical” method of interpretation espoused by Berkhof (and also by many in Confessional Lutheranism) the interpreter is cautioned to value the “history” in the Bible as more reliable than any other “history.”1 This author would suggest that the Bible contains the only factual representation of the past available in written form anywhere. Other historical writings, in this author's opinion, are at best able to show us some things and events. But those historical writings are not able to place those things and events with any certainty into the chronology and factual happenings of the past. Consider the field of Creation Science. This particular field of study is an attempt to study the science of cosmology (the study of the historical origins of the universe) in biblical terms. But it is actually much more than that. It is the imposition of Modernistic Materialism upon the text of Scripture. The field of Science is the embodiment of Modernistic Materialism. Science is based on repeatable predictability. This is what is, at least in pretense, the basis for its historicity. It does turn a blind eye to such repeatable predictability in the area of evolution, where such predictability is impossible. But that does not stop the creation scientist from trying to work within the parameters set by unscriptural Modernistic Materialism. Creation Science doesn't say: “By faith we understand that the worlds were framed by the word of God, so that the things which are seen were not made of things which are visible.” It says, for example: “If the system of flood geology can be established on a sound scientific basis, and could be effectively promoted and publicized, then the entire evolutionary cosmology, at least in its present neo-Darwinian form, will collapse.”2 Or Creation Science proposes interpretations of the Biblical text that involve vapor canopies or ice rings. The problem with efforts like Creation Science is that they undermine the Bible's definition of faith as that of a gift granted by God through the means of grace. In place of this biblical faith efforts to work within the framework of Modernism (such as Scientific Creationism) direct Christians to look at what they claim is or is not materialistically demonstrable. And faith rests on the rational abilities of mankind to work out the historical truth. In the past few years the press have brought the James Ossuary and what was called the Tomb of Jesus to the attention of the public. Both discoveries were said to have foundational implications for the Christian faith. Both were demonstrated by historical research and scientific research to be frauds. In the case of the James Ossuary such a demonstration would rhetorically imply that Christianity is false. In the case of the Tomb of Jesus the demonstration that it was false would rhetorically imply that Christianity might possibly be a legitimate faith. Modernism has become such a basic framework for many people that the reported results of such historical and scientific research have significant impact on the idea of truth or falsity of Christianity. The current descent into Modernism is shown by how much value the interpreter places on such “historical” information (which is merely another form of tradition) and makes use of it to limit the interpretation of Scripture itself. This includes the value he places on historical writings about the periods “before” and during Bible times as well as the value he places on the “historical” tools he uses (grammars, lexicons, textual criticism, commentaries, etc.). 1Frankly, there are too many quotation marks around special terms in this paper. For this the author offers his apology with the explanation that it is difficult in presenting a paper to modulate voice to emphasize the special use of a term or phrase. Let the quotation marks serve as clues to this modulation of voice. How does the interpreter go from the meaning of words and phrases to the declaration of doctrine by which souls are judged? There are many short cuts. And from a basic study of logic, these short-cuts end up being the all too familiar fallacies: appeal to force, ad hominem (abusive and circumstantial), argument from ignorance, appeal to pity, appeal “to the people,” accident, relevance, converse accident, begging the question, the complex question, etc. The use of a fallacy in act of interpretation does not determine the actual truth of the proposition set forth. It affects communication, teaching, learning, and understanding of that proposition. A fallacy is not a falsehood but a false argument, a false method of reason. But there are many truths, both revealed and experienced that cannot be justified merely by clear reason itself and, in the end, rely upon what logicians would term fallacy. The fact that Christianity is based on an appeal to authority does not make it false. Whether one describes the Christian faith with respect to objective cause (appeal to authority) or subjective experience (tautology) the veracity of the objective cause and the subjective experience are not invalidated. This fact demonstrates the absolute limits to the use of reason. This is why Lutheranism has used terminology to distinguish between the ministerial use of reason and the magisterial use of reason. But drawing clear arguments from Scripture with only the ministerial use of reason requires a very thorough knowledge both of Scripture and of the ways God's Word has been challenged through time. When the issue under discussion has a great deal of personal emotional investment and debate is hot, it is often a lot less work to take the short-cuts in hope that the rhetorical power those arguments have can win the day. It is often simply easier to make these appeals than to do all the work to make a good, sound, and clear line of argument that relies only on the ministerial use of reason subject only to the appeal to the clear statements of God's Word. The following is a short list of examples of these short-cuts. The list is incomplete. But the issues were selected because the author has found these some of the most commonly abused lines of hermeneutical reasoning. “This is what we've always thought.” Sometimes this is true, sometimes it is not. Sometimes this claim is made for the sake of imposing a new tradition that competes against the clear interpretation of Scripture. Both sides of the interpretive debate begin digging in the writings of the synodical fathers for scraps of evidence to present. The problem is the assumption that the traditional interpretation is correct and therefore no more exegetical work from Scripture is necessary. The issue here is not the veracity of the traditional interpretation. The issue is the ability of each interpreter to be able to show from Scripture how the interpretation is derived and why he can say without doubt that this is God's doctrine. If, as stated above, the specific goal of the hermeneutical task is the proper application of Law and Gospel to sinners, then it is the duty of the interpreter to show where and how such teachings are found in God's Word. Simply stating that “such and such is the doctrine of our synod” is to shirk responsibility and place the authority for faith and doctrine into the hands of a synod. The research into the synodical fathers can be a valuable tool for showing consistent testimony to what the synod has believed and taught. Such research can bring to light some very valuable interpretive material that has been lost to the current generation. And for these reasons that research should be done and presented. Through such research it may be shown that “what we've always thought” is in fact not what was always thought. This kind of research might also show that a particular issue has always been a difficult issue with wide opinions on various sides. The duty of the interpreter is to show how God's Word teaches something. Demonstrating historical consistency in doctrine is good and useful. Demonstrating gradual change in a position, though potentially unsettling, is also useful and beneficial. But in the end the interpreter's task is to enable others to see what God says in His Word. Bible translation is big business. Anyone who receives a Christian Book Distributors catalog or walked through a Protestant bookstore cannot help but be struck by the immense number of English translations available. Rick Warren is now famous for his best seller The Purpose Driven Life. In his third Appendix “Why Use So Many Translations?” he gives two reasons. These are 1) each translation has its limitations, and 2) the reader may be too familiar with a translation and so “miss the full impact of familiar Bible verses.” (p. 325) In practical application these reasons may be rightly understood as: 1) no single translation can support what he wants to teach, and 2) what he wants to teach is different than the doctrine easily seen in Scripture. It's in Christ that we find out who we are and what we are living for. Long before we first heard of Christ, ...he had his eye on us, had designs on us for glorious living, part of the overall purpose he is working out in everything and everyone. There is a debate going on that is decades old in the pages of Bible Translator, an academic publication of the United Bible Society for Bible translators. The debate actually goes back several centuries to Jerome's Vulgate and Luther's German Bible. The first study on the topic of which I am aware is Martin Luther's 1530 “Open Letter on Translation.” (AE 35:175-202) In this letter Luther explained how he sought to make his translation speak real German that anyone could understand without compromising the literal meaning of the original text. We do not have to ask the literal Latin how we are to speak German, as these donkeys do [the objectors to Luther's translation]. Rather we must ask the mother in the home, the children on the street, the common man in the marketplace. We must be guided by their language, by the way they speak, and do our translating accordingly. Then they will understand it and recognize that we are speaking German to them. On the other hand I have not just gone ahead and disregarded altogether the exact wording in the original. Rather, with my helpers I have been very careful to see that where everything depends upon a single passage, I have kept to the original quite literally and have not departed lightly from it...But I preferred to do violence to the German language rather than to depart from the word. Ah, translating is not everyone's skill as some mad saints imagine. It requires a right, devout, honest, sincere, God-fearing, Christian, trained, educated, and experienced heart. So I hold that no false Christian or sectarian spirit can be a good translator. Eugene Nida set the stage for the current academic debate with his 1964 Toward a Science of Translating, in which he took the spectrum from woodenly literal translation to free paraphrase and recast them with the terms “formal equivalence” and “dynamic equivalence.” Nida sought to make Bible translation more objective by creating a taxonomy of processes and couching the process in some new academic terminology. But he had to come back to the central issue of the role of the translator as a creative role. This hearkens back to the last two sentences of the previous Luther quotation. “Traduttore, traditore!” The more a translation is geared toward a “dynamic equivalence” the more it depends upon the translator's own theological beliefs. Readers should note that this translation has defined “spiritual self” and “unspiritual self” in other contexts with regard to how actively a person pursues being Christ-like by his own righteous living. Note also the insertion of the word “gifts” in this context where Paul is speaking explicitly about the ability to believe the Gospel. This author believes the worst feature of the new translations relates not only to their “dynamic” translation of the text, but to the fact that they are transient. The translation done to “reach a generation” or a specific societal sub-group has a dividing effect on the church of God. God's Word changes from translation to translation, from one group to another. The translation is done to fit specific groups and prevents unity in common expression of the Word of God. Each group's “Word of God” is different from another group's “Word of God.” Liturgically and catechetically this is an abysmal problem. The problem of fractured linguistic groups is not new to the Church. Nor is the demand for unified linguistic expression with respect to Scripture and worship. “23 In those days I also saw Jews who had married women of Ashdod, Ammon, and Moab. 24 And half of their children spoke the language of Ashdod, and could not speak the language of Judah, but spoke according to the language of one or the other people. Pastors are commissioned by Christ to be interpreters of the Word and instructors in the Word (Mt 28:20). Ministerial students aspire to fulfill this duty of Christ's call. So in general, while it is helpful for them to be aware of these various translations and what their agendas might be—it is of greater help for them to use a more formally equivalent translation that is designed to serve more than one generation or social sub-group. It is better for the whole congregation and wider groups of congregations to be able to have a common language from Scripture. If at all possible an interpreter should be able not only to discern the many levels of tradition that affect his own hermeneutical judgment. But he should also be able to communicate clearly and instruct others as to how these levels of tradition come to bear on the interpretation of Scripture. This includes real traditions that the interpreter and his audience have inherited. This also includes competing traditions, whether they are actually inherited or whether they are new ideas dressed in the guise of venerable tradition. This author believes that lack of discernment in this area is one of the chief problems facing theological discourse in Confessional Lutheranism today. The Christian faith rests on one authority: Scripture. Here is where all engaged in biblical interpretation and instruction would do well to read and understand Martin Chemnitz' listing of eight types of tradition and the nature of their authorities as he has laid them out in the Second Topic of his Examination of the Council of Trent.2 This is not the place for a restatement of Chemnitz, as worthwhile as that would be. Here the author would wish to focus on one of the major problems to interpretation that is caused by holding on to tradition. The problem is the taking of offense. What is meant is not the giving of offense: i.e., leading someone to fall into sin by an act of Christian freedom done without consideration to the weaker brother. What is meant is someone's sense of honor, pride, propriety is violated. Someone gets plain old ticked off at another and may refuse to listen to any further discussion. This is an important distinction to make. The one who has truly offended in the sense Paul describes in I Cor. 8 is not crying out “I'm offended!” Nor is he making the claim, “You've caused offense!” On the contrary, he has, by his own weak conscience and mis-perception of another's act of Christian freedom, been led to believe that what is sin is permissible. Confessional Lutheran pastors are familiar with these situations within their own parishes when presenting proper interpretations on the topic of closed communion, women's suffrage, and the like. The problem is like a mine field. The pastor does not know there is even an issue to deal with until he hears the“click.” But most often he does not hear this warning but is left to sort through the leftovers of an explosion that ripped up some part of his congregation without the pastor knowing why. Self-effacement goes a long way in a congregation when one has stepped accidentally on a mine that deals with a personal or family tradition. In some cases it may be well nigh to impossible to lead the individuals into a correct interpretation of God's Word. But most often patient, gentle, and persistent teaching of God's Word accomplishes a great wonders. The interpreter must be wary of taking offense. If someone claims the interpreter's arguments are poor and fallacious, the interpreter should take this criticism to heart. This does not mean the interpreter should develop a feeling of persecution, sadness or anger, it means that the interpreter should be able to ask himself the hard questions about how much of his own interpretation depends on tradition and how much on the Scripture itself. Where did the interpreter learn this particular interpretation or that particular interpretation? Can the interpreter show the verses and contexts of Scripture that are the basis for his teaching? Does the interpreter understand the relationship between the Scriptures and the Lutheran Confessions and how this limits what the interpreter may claim about the authority of his own parochial traditions? All who claim to teach in the name of Christ must base their claim on an appeal the true authority: God's Word. Above was mentioned αγαπαω/φιλεω, and the “Headship Principle” as justification for submission of women in the Secular Estate. There is Gn 9:24-5; 10:6-20 as a justification for the enslavement of Africans (Stöckhardt 1900:15;Rupprecht 1947:36, and Kretzmann http://www.kretzmannproject.org/PENT/GEN/GEN_9.htm ) Berndt and Rathman offered a mild correction (2003:32 note 1), Franzmann offered a good correction (1980:85). Another type of example comes from traditional interpretations based on the Root Fallacy (Carson 1984:26ff); and others derived from Etymological Fallacies (Barr 1961, 1987). Another interpretational tradition is the use of the Thief on the Cross as an example of someone who went to heaven without the sacrament of Baptism. Is it possible that he was not baptized? Yes. Do we know he was not baptized? No. Therefore, any exposition on the necessity of Baptism using the Thief on the Cross as an example of faith without baptism is only conjectural. Another example is the actions of the Publicans. Zacchaeus and Levi are primary examples because they are names. Often it is assumed that the tax collectors extorted money above what the law actually allowed them to take. This assumption fits with the view of our own sinful nature and its view of the IRS in the United States. But the assumption of corruption in duty cannot form a basis for interpretation of the actions of Zacchaeus, Levi, or any other tax collector. The 8th Commandment applies to the interpreter of the Bible as well as much as anyone else. Perhaps Zacchaeus was sincere in his claim. Perhaps he had not defrauded anyone. While preaching on the sinful nature and how it probably would affect Publicans may be biblical, any stereotype forced on an individual Publican in the New Testament is not legitimate. 4Imagine, if you will, the possibility that a congregation could give as one reason for removing their divinely called pastor the fact that he chanted in worship, an act that in their traditional interpretation is too Roman Catholic. It is not only possible, it has happened. One reason that pastors begin to rely on traditions is poor training. Training in hermeneutics has as its own goal to equip a sinful man with the knowledge and skills necessary to read the text of Scripture and use the tools at his disposal with an understanding of their and his own limitations. Poor training can be caused by students who are inadequately prepared to begin specialized language and hermeneutical training. Poor training can be due to an ill equipped teacher. And it can be due to a poorly conceived and overly compartmentalized approach to ministerial training. Considering the student: If a student is not conversant in the linguistic and grammatical study of his own native language he must either undertake considerable self-education in this area or be left to flounder. If, e.g., one does not have the vocabulary and skills to understand transitive/intransitive, active/passive, subject/predicate, or direct/indirect objects, etc. in English he will not be likely to make the appropriate connections in the original languages. A possible solution for this is remedial coursework and tighter application requirements. But even more important is that the student recognize such weaknesses in himself and strive to overcome them. If he is unable to overcome such weaknesses, he should be wary about the kinds of claims he makes, being honest about his own limitations. Considering the teacher: Whether the teacher is teaching Historical, Biblical, Doctrinal, Symbolical, or Liturgical Theology, the teacher must be able to constantly show the relationship between the topic at hand and its application to the preaching of the pastors in properly applying Law and Gospel. Not every teacher is able to do this or do this well. The temptation for the teacher is to hide this weakness from others, and maybe even from himself. In hiding such weaknesses the teacher fails to give the students the knowledge, tools, and skills they should have been given. For example: Imagine an Old Testament exegetical course taught by a professor who does not know Greek or is unfamiliar with the Septuagint. The Septuagint is neglected, probably not even brought up, much less used in class. The students do not learn about the Septuagint, its contents, its relationship with the New Testament. The Septuagint becomes irrelevant, and even sinister. The only thing the students might know is that it is a Greek translation of the Old Testament used by the Eastern Orthodox and that it has extra books. And, they might possibly be told that the New Testament tends to quote it rather than the Hebrew text. But they would not be enabled to read the Septuagint, and thus find valuable lexical and semantic insights; such as the fact that αγαπαω is used not only of godly love, but also of incestuous desire. Worse, these students go out and create scandal by teaching the same ignorance to the congregations. This author has recently become aware of a pastor who was removed from his parish for putting into his bulletin the passage reference for the Introit to Pentecost (Wisdom of Solomon 1:7) and referring to it in his sermon. One wonders how Martin Luther would fare in such a climate, but then such teachers, students, and congregations would probably also be ignorant of Luther's, Chemnitz', and Gerhard's use of proof texts and sermon texts from the Apocrypha. A possible solution for such problems is to require that all teachers have advanced degrees in the field that they are teaching. But advanced degrees do not really guarantee competency. It is more important that the teacher recognize such weaknesses in himself, admit them to his students, and encourage them to surpass him in such areas. Then, he should strive to be constantly learning and improving himself in the subjects he is supposed to teach. Considering the approach to ministerial training: The whole of ministerial training is to foster the growth of men as students of Scripture who have the breadth of knowledge and the tools to properly apply Law and Gospel as well as correctly administer the Sacraments. All the branches of Theology have at their base the study of God's Word and proper teaching of God's Word to the assembly. All the branches of Theology are intimately interrelated. When one theological branch is taught without these relationships being brought to the students' attention, the relevance of one or of the others is left in obscurity. The students may be able to make these connections on their own, but more often than not a complex system of individual and discrete doctrinal pronouncements come to the fore. Often these are termed “principles” rather than “doctrine.” Once example of such compartmentalized doctrinal “principles” is the popular “headship principle” ostensibly based on the I Cor. 11:3 and the use of αυθεντειν in I Timothy 2:12. Principles take the place of the clear declarations of God in His Word. This causes confusion about what a proper Christian application of a principle—such as the “headship principle”—might or ought to be. Missing from the whole discussion on this particular principle is any reference to the Bible's teaching on the Three Estates and the nature and scope of authority in each of these estates. Rather than the clear Word of Scripture a person's conscience becomes the final hermeneutic and authority for determining God's will. Part of the training which may fail the student is a proper understanding of the nature of the tools he is to learn to use. One significant problem in the training of biblical interpreters is the simple lack of comprehension about their own weaknesses. Some seminaries are satisfied with what they call a “working” knowledge of the languages. What this tends to mean is that the student is shown which books he can use to look up words or grammatical constructions. It is possible for a student to have a good grasp on the way languages work in general and do a reasonably good job at interpreting the original text; even if he is not able to read the original language very well. One could make the reasonable assertion that such a student would need to have a fairly good grasp of Scripture in a sound translation and a solid understanding of doctrinal, historical, liturgical and symbolical theology. It is possible to be a good preacher and pastor without knowing all the letters of Greek or Hebrew. But the notion of a “working” knowledge tends to predispose students to the false idea that they are, perhaps, competent enough to make pronouncements based on the original languages. Part of the problem is a lack of understanding about the nature of the tools placed at their disposal. For example: Hebrew lexicons such as BDB, KB, and Holladay have as basic presuppositions in their lexical treatment the Documentary Hypothesis and various literary and historical theories that have grown up in the wake of Wellhausen. Works such as DOCH revise the literary history based on modern historical linguistic theory and add another layer of modern linguistic semantic theory. Hebrew grammars such as GKC, Jouon-Muraoka have, in addition to these historical critical literary theories, the presupposition of an evolutionary historical linguistic development of the Hebrew language from and idealized Proto-Semitic language. Muraoka updated Jouon's grammar to include modern historical linguistic theory. Grammars like the one by Walke and O'Connor shift focus to the various modern linguistic syntactical and text-semantic theories as an organizing principle. The picture is similarly confusing for the tools available for Old Testament and New Testament Greek. The simple lesson is that students should read the introductions to each work and note the explicit presuppositions upon which each work is based. Louw-Nida is very different from BAGD, which differs greatly from Thayer. Robertson's tome is not so much a grammar as it is a protracted argument for the historical evolution and nature of Koine Greek as a distinct dialect. We should note additionally that lexicons do not give definitions. They give a list of probably appropriate English equivalents. Similarly, grammars of dead languages do not give rules, they give catalogs of what the authors think are the explanations of forms. That is to say, lexicons and grammars of dead languages are not prescriptive, they are descriptive. They do not teach the student how to become a native speaker with native speaker instincts. They are different attempts to figure out what was meant by the original writers, attempts based on sometimes very different theories. And as such, they play a distant second fiddle to the context of Scripture in figuring out the meaning of Scripture in a particular passage. But the importance of establishing context bring us to the question of the text itself. Any introduction to modern textual criticism (Tov, Greenlee, Wurtwein, Deist, Metzger, Aland and Aland) will quickly show that authorship, historical background, authenticity, integrity, and unity are intimate aspects of the practice of textual criticism—not only of each book of the Bible, but of each manuscript of each book. From the time of Astruc and Wellhausen the philosophical school of Modernism took hold in academic circles. The then new scientific historical criticism began to be identified with higher criticism. Another false dichotomy was introduced: “Higher Criticism bad, Lower Criticism good.” Bernard Ramm's textbook, Protestant Biblical Interpretation, treated historical criticism with only 21 pages in the 1956 edition. This had grown to 30 pages in the 1970 edition. Herman Otten's 1965 Baal or God is one of the earliest publications to offer a popular critique of the historical critical method. Ralph Bohlmann's Principles of Biblical Interpretation in the Lutheran Confessions, published in 1968, barely mentioned historical criticism at all. But his 1983 revised edition includes 9 pages of discussion on the issue. Published in 1976, Harold Lindsell's The Battle for the Bible became mainline Protestantism's handbook on the history of the battle to defend Biblical Inerrancy. Meanwhile, from 1969 and onward the nominally Lutheran Fortress Press was publishing the historical critical Guides to Biblical Scholarship at a rate that would total 27 of these “guide” books by 1995. These are just the Lutheran sources. This does not count the various academic societies and journals that were activly publishing historical criticism since the late 1800s,4 but mainly unnoticed by Confessional Lutheranism. This may seem a bit of a digression, but it is necessary to understand the milieu in which Textual Criticism became an academic pursuit. There was no academically neutral ground on which Textual Criticism could establish itself. It was in 1882 that Wescott and Hort produced their Introduction. Readers who are not familiar with Wescott and Hort's theories for formulating textual families—or with the denial of inerrancy and Divine Inspiration by their inheritors—are already unable to use the tools of Textual Criticism. This last is not an insignificant claim. There are probably many Confessional Lutherans who feel competent with the critical apparatus (ap. crit.) used in the BHS, HOTTP/HUBP , Rhalfs, UBS, or NA. But this feeling of competency is ethereal. BHS, while representing the St. Petersburg Codex (Codex Leningradensis) has an ap. crit. which is highly selective, and the selectivity of which is based on the historical critical research done by the editors on the particular books of the Bible they were to prepare for the BHS. Rhalfs' ap. crit. is nearly useless in and of itself with problems already widely known. HOTTP, UBS, and NA suffer from a variety of problems common to their own methodology. Three main issues in these modern editions are 1) strong textual bias; 2) the presentation of meaningless data; and 3) leading the interpretation. The author has discussed these issues in detail elsewhere.5 Here these issues are dealt with in summary. The Presentation of Meaningless Data: The way the variants are presented in the ap. crit. of these edititions makes it impossible to reconstruct any individual manuscript. This is a foundational flaw. It means that it is impossible for the user of their eclectic text to determine why a particular variant might have occurred in the context of the original manuscript. Thus, it makes genuine textual criticism impossible. Notice that there were no punctuation marks, spaces, paragraphing in use when the NT was written. Dictionaries and grammars as we know them did not exist in any practical way. 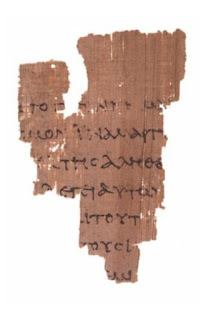 What the student learns today is a Koine Greek that has been standardized over the 2000 years since the writing of the New Testament. 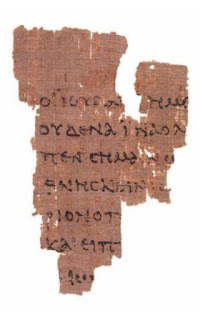 In order for the modern student to interpret 1st or 2nd century Koine writing the student must make judgments about word division, phrase division, sentence division, and paragraphing. The student must decide upon accentuation and breathing. For example: this fragment gives us two examples of diaeresis. The first can be seen in this graphic and is used according to the rules for Koine taught to students today (line 2, ουδεναϊνα). The second use is in line 2 verso (that is: on the other side) where the diaeresis follows a consonant and marks the word ϊνα. This second use is not in accord with those rules. Each of these decisions is an interpretative decision. Modern critical editions of the GNT have made all those decisions for the reader. And if the reader is not practically aware of these decisions, these interpretations will affect exegesis unintentionally. For the most part one can trust the word divisions, punctuation, etc of the modern critical editions. And for the most part one can trust the text presented in them. But the exegete must never pretend that at these various layers of interpretation many significant decisions have already been made for him. The exegete must also be aware that the textual traditions embodied in the modern critical editions of the GNT have deliberately steered away from the textual base used by Luther, the Reformers, the Confessors, and the great theologians of Lutheranism. They have done so with an explicit denial of Inerrancy and the Scriptural Doctrine of the Preservation of the Scriptures (Mt. 5:18; Jn 8:31-32; 17:20; Eph. 2:20). Examining the text of the GNT for the sake of Lutheran doctrine is not a task to be done lightly. Since the text of Scripture is the measuring stick, the exegete must make himself aware of how far his modern critical edition differs from the measuring stick used by Lutheranism as the basis for doctrinal interpretation up to the end of the 19th century. 4For example: influential academic journals- Vetus Testamentum, Novum Testamentum, Zeitscrhrift für die alttestamentliche Wissenschaft and Zeitscrhrift für die neutamentliche Wissenschaft; influential academic commentaries International Critical Commentary, and the “Polychrome Bible” of Haupt. 6Other examples: Metger 1975:xxiii, Aland, et al., 1987:41*, Aland & Aland 1987:4, 6-7. Remember that these are the lead editors of the UBS GNT and the NA. Hermeneutics is such a broad topic that for a short presentation it is necessary to focus on particular issues. In focusing on issues it is important that those issues be relevant to our current situation. An unfortunate consequence of this focus is that much of what will be presented is a negative critique on a limited selection of pitfalls into which Confessional Lutheranism has blundered. The danger here is that one may come away from this paper with the notion that the author despairs of all current efforts at interpreting the Scriptures within the confines of Confessional Lutheranism. He does not. And the author does not wish to lead the reader into such despair. But pointing out problems is an exercise in the interpretation and application of the Law, not the Gospel. It is the author's sense that Confessional Lutheran interpreters fall into traps when they fail to take into consideration the Confessional, Dogmatic, Historic, and Liturgical schools of Theology when engaging in the hermeneutical task. Historical Theology shows us that the Church has made many mistakes interpreting the Scriptures in times past. Confessional Theology shows us how the Church has made its stand on the clear words of Scripture on particular interpretations of Scripture. Dogmatic Theology shows us how the Church has refuted the errors of the heterodox and heretical teachers of the past in a systematic presentation of Scriptural interpretation. Liturgical Theology shows us how the text of Scripture has been systematically and beneficially applied to the lives of the saints throughout time and in our present. Neglect of any of these schools of theology in the exegetical task in an effort to “get back to the Bible” will leave the exegete blindly falling into the traps of Donatism, Papism, Enthusiasm, and any of the other “isms” that the Church has already learned to deal with on the basis of Scripture. This paper is organized into two main sections. The first section deals with issues that are more material or process based in nature—issues affecting: training in exegesis, tools used in exegesis, textual issues, translational issues, and the nature of tradition. The second section deals with issues that are problematic on specific points of interpretation: moving from a text's meaning to the establishing of doctrine; determining how Modernism has affected the process of interpretation; and some considerations on prooftexting and anecdotes as interpretive acts. None of these topics is covered definitively. This paper is meant to be a type of introduction to how these problems may have affected interpretation in Confessional Lutheran hermeneutics. Preparing the Exegete for the Hermeneutical Task. For Confessional Lutherans hermeneutics is a discipline that does not occur in a vacuum. The specific goal of the hermeneutical task is the proper application of Law and Gospel to sinners. This goal encompasses the need for specialized linguistic and philosophical terminology which allows interpreters to be able to critique and discuss the process of interpretation and its implications. The purpose for such a specialized and possibly technical discussion is still the proper application of Law and Gospel to sinners. This specialized and technical discussion is necessary both for the sake of training new men as interpreters and for the sake of providing a critical self-evaluation of the process as it is being practiced by the pastors and teachers of the Church. Where interpreters are unable to engage in this specialized and technical discussion they become dependent upon traditions of interpretation, whether they will admit it or not. Sometimes the traditions save the interpreter from gross error. Knowledge that Luther taught a certain way on a topic and that Lutherans hold that view as truth can curb some interpreters from going in a bad direction. But often enough interpreters who depend on tradition adopt traditions of interpretation from influential voices and written works which are contrary to Scripture. wilt thou not tell me? wherewith he had loved her. This particular lexical issue has been treated at length already by many others.2 Important here is to note that the tradition of interpretation around these two words became so entrenched in the 20th century that many preachers based their edification of the flock on this tradition rather than on the texts in which these words were used. More will be stated on traditions later in this paper. At this point it is enough to realize that traditions—both good and bad, both ancient and contemporary—can become a short-cut to actually reading and interpreting the text of Scripture in its own context. 1As does Kuske 1995:79 following exactly the same reasoning as Berkhof. Both seem to be merely rewording or summarizing Terry work from the previous century, see Terry 1974:200f. 2See for example: Barr 1961:211, 216f; Carson 1984:30f; Silva 1983:96f. 3I cannot count the number of times that I've heard pastors of Confessional Lutheran synods make the ignorant and audacious claim that the Office of Pastor is not instituted in Scripture. There hasn't been an update here for a little while. The reason is that I am working on a translation of JAA Ottesen's report on a pastoral free conference on the topic of the 14th Article of the Augsburg Confession. I'm about 1/4 the way through the translation. I'd hoped it would be ready by Synod Convention (this coming week) but it won't. And several other pastoral duties have swamped me right now. For those interested you can find out more about those duties at my family blog. The issue concerns the divine institution of the local congregation as it differs from other organizations that the Church in her freedom may choose to establish. Vore synodemøder. III Refereret af S. Lee. Our Synod Meeting, part 3, presented by Sophus Lee. Torsdag eftermiddag meldtes 8 prester ankomne. Formand Torgerson fra Iowa distrikt blev af formanden budt velkommen til mødet. Hjælpesekretærer blev udnævnte af sekretæren. En indstilling fra komiteen for indberetningerne blev oplæst og behandelt, og de forskjellige sager henviste til vedkommende komiteer. Derpaa begyndte man med læreforhandlinger. Temaet var: Den kristne lokal= eller stedsmenighed. Referent past. L. I. Ierdee. Thursday afternoon it was reported that eight pastors arrived. Chairman Torgerson from the Iowa District was bid welcome to the meeting from the chairman. An assistant secretary was appointed by the secretary. A recommendation from Committee for Reports was read out and discussed , and these various matters were referred to the appropriate committee. Then we started with the doctrinal discussion. The topic was : The local Christians—or the Local Congregation. Pastor L. I. Jerdee presenting. Den kristne lokal= eller stedsmenighed. b) men af guddommelig oprindelse. Den er ifølge Guds vilje stiftet af ham, opholdes ved ham og skal ved hans kraft bevares. b) but of divine origin. It is according to God's will instituted by Him, sustained by Him, and shall by His power be preserved. II. Hvad den kristne stedsmenighed er. II. What the Christian Local Congregation is. a) Efter sit indre væsen er den samlingen paa et bestemt sted af dem, som tror paa Kristus og har fælles bekjendelse. a ) According to its inner nature it is the assembling together at a certain location by those who believe in Christ and have a common confession. b) Efter sin ydre skikkelse er den samlingen paa et bestemt sted af dem, som har en fælles bekjendelse og holder sig til Guds ord og sakramenterne. b ) According to its external form it is the assembling together at a certain location by those who have a common confession and hold themselves to God's Word and Sacraments. III.. Hvorledes man bliver et virkeligt medlem af den kristne stedsmenighed. III. How can one be a true member of the Christian Local Congregation. e) og derved, at man bejærer optagelse i menigheden og ved stemmegivning optages i samme. e) and thereby, that one assents to becoming a member of the congregation and by vote is taken into the same. IV. Dens goder og rettigheder. IV. Its Property and Rights. 5 til at drive mission, baade den indre og ydre. 5 to establish a mission, whether domestic or foreign. Referenten udtalte under første punkt, at der i verden var en hel del foreninger af den mest forskjellige karakter, men de var alle lige deri, at de var of menneskelig oprindelse. Menigheden er den eneste, som er af guddommelig oprindelse. I samtalen over dette punkt deltog formand Bjøro, dr. H. G. Stub, Pastorerne J. G. Monson, Olaf Hoel og T. O. Tolo. The Presenter explained under the first point that there in the world was filled with unities of the most varied character, but yet they were all alike in that they were of human institution. The congregation alone is instituted by God. President Bjøro, Dr. H. G. Stub, Pastors J. G. Monson, Olaf Hoel and T. O. Tolo took part in the discussion concerning this point. Til medlemmer af læreanstalt=komiteen pastorerne J. W. Preus, J. D. Ylvisaker, J. R. Vaaler og S. M. Orwoll samt repræsenterne J. R. Større og Fred N. Field. To the membership of the Seminary Committee: Pastors J. W. Preus, J. D. Ylvisaker, J. R. Vaaler and S. M. Orwoll with representatives J. R. Større og Fred N. Field. Fredag formiddag fortsattes med lærerforhandlinger over punkt 1 og 2. Som komite til at justere læreforhandlingerne udnævntes pastorerne Blilie, Erdahl og Bothne. Følgende menigheder optoges i synoden: Sions menighed, Hazel Run, Minn.; Lily menighed, Lily, S.D. ; St. Pauli menighed, N.D. Treenigheds menighed, Esmond, N.D.; Froens menighed, Flaxton, N.D. Pastorerne N. Brandt og R. O. Brandt af østlige distrikt optoges som raadgivende medlemmer. Fredag eftermiddag .... Resten af sessionen anvendtes til løreforhandlinger over punkt 3. Friday afternoon ... The rest of the session was given over to the Seminary Committee concerning point 3. No negative remarks were recorded here or in the following general pastoral conference, nor in the report to the Convention in 1905.